Upon graduating from college, she was hired as a counselor at the controversial, reproductive health services provider's clinic in Bryan, Texas. Over the course of the next eight years, she rose up the ranks to office director, even though she was privately conflicted over whether the organization's primary function was to inform pregnant women about their options or merely to perform abortions. After all, she not only came from a conservative, pro-life family, but felt overwhelming regret about the two abortions she had undergone herself earlier in life. So, between pressure from her parents and the almost daily confrontations with demonstrators, Abby's conscience began to get the better of her. That is the touching transformation convincingly conveyed in Unplanned, a poignant, cinematic portrait co-directed by Chuck Konzelman and Cary Solomon. 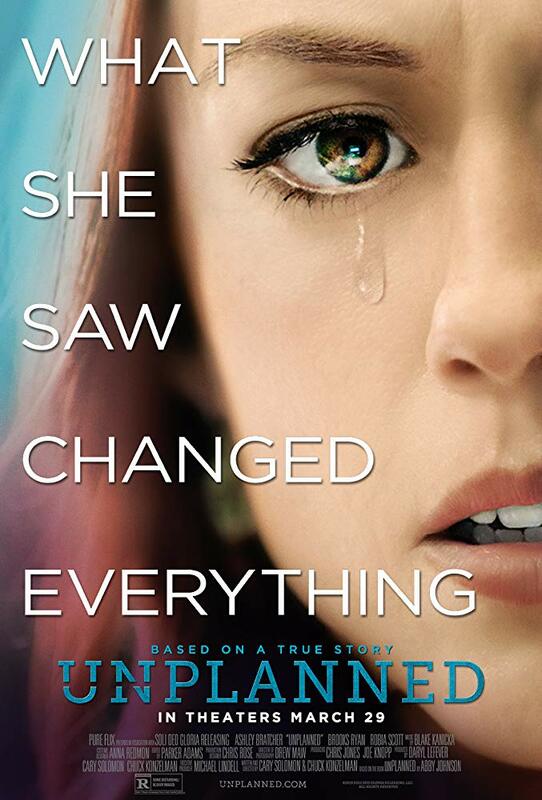 Unfortunately, abortion is such an incendiary issue, this is the sort of film audiences will be inclined to judge without seeing based on their political persuasion, although it's adapted from Abby Johnson's very personal memoir. I just saw UNPLANNED at a special screening last night. This is a well-made film about an incredible story! It exposes the TRUTH about what is really going on with abortion. I urge everyone who can to see this film this weekend. Just saw the movie. To be honest upfront, I'm pro-life, previously pro-choice. I found some of the performances stirring, especially Abby and her Ice Queen boss at PP. Good performances--especially the boss. The women at the PP Center were also very good--believable and relaxed across the board. Abby's husband, unfortunately, was dreadful--just a hunky guy told to read lines. The sleazy lawyer on Abby's side at the end was good, and Abby's parents were solid. I concur with the review, in that this persuasion film was quite persuasive until the heavy-handed last quarter. At the beginning, the abortion that changed Abby's mind was, frankly, real and honest. One thing I know about my pro-choice past is that virtually no one in my crowd had ever really seen what we were defending--in fact, we avoided seeing it to maintain confidence in our position. Watching this supposed "fetal tissue" kicking and struggling for life on the ultrasound was a terrifying image--one which I challenge anyone to see. But the final quarter of the film became less personal, reeling off pro-life talking points and naming funders. Meh. Too preachy. Out of 4 stars, I give this a healthy 2.5. It's no "I Can Only Imagine," but it's certainly better than most faith-based films. First to Sly Fox - Thank you for making the effort to review UNPLANNED. For a film that is very likely to end up in the top 10 this weekend -- it is sad to see only 3 reviews this far on opening day (today). To Andy -- Thank you for your frank comments. Please realize that this is a TRUE story. In fact, Abby Johnson had full say over the script and made sure that everything was accurate. One of the reasons for this was that, as shown in the film, Abby was sued by Planned Parenthood. I assure you that if this film presented a false view of the events, Planned Parenthood would likely have sured again. The important of the last part of the movie -- in particular the lawsuit/trial -- was to emphasize the nature of PP and how TRUE Abby's story really is. Also it highlighted how rich and powerful PP is -- yes -- including being financed by some big money people. Also -- a very key scene in the end was Abby counseling that one girl and persuading her not to get an abortion. Yes-- maybe the ending wasn't as exciting as the earlier parts -- but still a needed part of the story. Oh, and also it helped to see the building torn down and that very special scene of mourning over some of the many babies that had been lost to abortion. In audiences where I have seen it (two packed screenings) with lots of women -- I assure you those scenes were especially emotional moving. This is a real story -- may it touch many lives.